Dec 2014. A paper published in Nature by Julia Schmale and colleagues urges: Air pollution: Clean up our skies Improve air quality and mitigate climate-change . Dec 2014. Yet another study linking autism to PM2.5 pollution Prof Frank Kelly, the director of the environmental research group at King's College London, discussed the links between air pollution and autism: "I think if it was this study by itself I wouldn't take much notice, but it's now the fifth that has come to the same conclusion." Another new study in Israel provides new evidence linking high exposure to air pollution to an increased risk of congenital malformations. Dec 2014. Submissions on Australia's Ambient Air Quality NEPM show overwhelming public support for stricter air pollution standards - PM2.5 standards of 6 ug/m3 (annual) and 20 ug/m3 (daily max); PM10 standards of 40 ug/m3 (daily max) and 20 ug/m3 (annual average). Many submissions called for the standards to be adopted immediately. An annual PM2.5 standard of 6ug/m3 would save 700 lives per year - every day of avoided delay would prevent about 2 more premature deaths. Dec 2014. Wood burning fires to be completely banned in Paris. Wood burning has already been banned in Paris since 2007 as the main source of heating, but has been tolerated for occasional use .... The complete prohibition is a direct result of trying to reduce the concentration of fine particles levels in Paris (PM10 particles of diameter less than 10 microns). Wood burning currently contributes 23% of the PM10 levels in the Ile-de-France department, the same as vehicles. Dec 2014. State considers banning wood burning from November 1 to March 15 ... "wood burning emits particulate pollution at a far greater rate than equivalent amounts of energy expended in modern automobile engines, industrial plants and other contributors to the infamous annual inversion in Utah’s most populous Northern Valleys." State seeks input on proposed wood smoke ban An outright prohibition on wood burning during the notorious inversion season (from November to March) along the Wasatch Front and in Cache Valley is under consideration by Utah pollution regulators ..
Nov 2014. Melbourne councils band together to buy 100GWh of clean energy direct. A group of Melbourne councils are banding together to bypass the renewable policies of the state and federal governments. Nov 2014. Childhood brain tumours linked with parents' activities. An AUSTRALIA-wide case-control study has found men who refuel their cars more than four times per month or use a closed wood heater before their child's birth may increase the risk of their offspring developing brain tumours. Nov 2014. American Lung Association in California Cautions Against Wood-Burning and Urges Cleaner Alternatives for Winter Heat: the American Lung Association in California is urging the public to avoid wood burning and to consider cleaner burning alternatives. "Burning wood emits harmful toxins and fine particles into the air that can worsen asthma and chronic obstructive pulmonary disease (COPD). "As with any pollution, children are especially at risk. Their lungs do not fully form until the age of 18 and exposure to higher levels of wood smoke can lead to reduced lung function and risk of future lung disease. For children with asthma, breathing wood smoke can lead to serious asthma attacks and breathing emergencies." Sept 2014. NEPC Consultation on proposed PM2.5 and PM10 standards. Everyone concerned about the health effects of air pollution should comment before the 10 Oct closing date. Residents of capital cities (and Morwell) should consider consider attending a public meeting: attending a public meeting (see RH column for locations). The true net benefits of adopting the economically feasible measures are at least $24 billion, not the claimed $.8.8 billion. Measures that would generate an estimated $15 billion in net benefits (from woodsmoke-control) were omitted from the economic analysis, implying that the NEPC did not consider all economically feasible measures. There is no safe level of PM2.5 pollution. Adopting all economically feasible measures (including the woodsmoke-control measures recommended by the NSW Asthma Foundation) would allow stricter limits of 6 μg/m3 annual average PM2.5 and 20 μg/m3 daily average, saving about 700 lives per year. On average, every day bureaucratic delay results in another 2 unnecessary premature deaths. Sept 2014. Visiting Doctor Warns of Smoke Dangers: A Utah based doctor is warning Fairbanks residents about the dangers of smoky air. As KUAC’s Dan Bross reports, Doctor Brian Moench (MENCH), who scheduled to speak in Fairbanks tomorrow (Sat. ), cites medical research and his own experience in a Salt Lake City hospital, to paint a dire picture of the health impacts of fine particulate pollution. Sept 2014. ABC NSW 7:30 Report interview with NSW Roads Minister Duncan Gay saying that, for PM2.5 (the most hazardous air pollutant), over 50% of PM2.5 comes from open fires (and domestic wood heating), but only 7% from cars and trucks. Sept 2014. Dr. Brian Moench, M.D., President of Utah Physician's for a Healthy Environment gives an excellent overview of the health and environmental hazards of wood smoke pollution. July 2014. State's top doctor says we should consider banning wood fire heaters NSW Chief Medical Officer Kerry Chant says wood heaters are so detrimental to health she supported banning and phasing them out in built-up urban areas as an option to control wood smoke. July 2014. Wood smoke warning issued to asthmatics "Wood heaters produce more pollution than either tobacco or motor vehicles during the winter months, according to the Asthma Foundation NSW. "Foundation CEO Michele Goldman said the average new wood heater in cold areas emitted as much pollution as 370 new diesel SUVs each travelling 20,000 km per year. July 2014 Daughter of carbon monoxide poisoning victims pleads for wood heater awareness: “They were such senseless deaths." According to the Firewood Association of Australia, even in a correctly operated wood heater or fireplace, some of the combustion gases will condense on the inside of the flue or chimney as a black tar-like substance called creosote. June 2014 Wood fire heaters: the hidden killer Article in the SMH and Age by Heath Gilmore. "The air pollution from wood fire heaters now poses a bigger immediate health danger to Sydneysiders than cars or cigarettes. "Health experts say the growth in wood fire heaters and the resulting smoke accounts for more than 60 per cent of Sydney's winter air pollution, triggering complications among asthmatics, emphysema and chronic bronchitis sufferers. "Asthma Foundation CEO Michele Goldman said Australians should be alarmed by the dangers posed by wood fire heaters ....Ms Goldman said the Standards Australia committee had so far had failed to take into consideration the concerns of health groups . She said the committee was dominated by the wood fire heating sector and industry groups with no medical experts among its membership. Australian Lung Foundation spokesman Dr James Markos said wood fire heaters should be banned from urban areas. He said real-life emissions from new wood-heaters had little relationship to measurements from a perfectly operated test model under laboratory conditions. "There is no safe level of wood fire smoke in urban areas," he said. Note that only 4.3% of Sydney households use wood as the main form of heating. It takes only a small proportion of households with woodheaters to cause a major pollution problem. June 2014 Smoke from a poorly maintained wood fire flue has been determined as the cause of a couple's death last August. "A coroner's report has shown that the tragic death of an elderly Cowra couple in August last year was the result of carbon monoxide poisoning." ... According to the report the deaths, which occurred in the lounge room of the Hanna Street home .... were the result of carbon monoxide from a poorly maintained wood heater." June 2014 Autism and schizophrenia linked to air pollution A study by the University of Rochester Medical Center looked at the impacts of air pollution on mice, finding that exposure in early life produces harmful changes in their brains, including an enlargement of part of the brain that is seen in humans who have autism and schizophrenia. The peer-reviewed article explains that mice were exposed to ultrafine pollution of < 0.1 microns. About 50% of woodsmoke particles are less than 0.3 microns and a large proportion of these would be less than 0.1 microns, so breathing woodsmoke at the levels experienced in many residential areas is likely to have a significantly increase the risk of being affected by these problems. Other research has linked exposure to woodsmoke or PAH (the main toxins in woodsmoke) to genetic damage in babies, reduced IQ when children start school and behavioural problems such as anxiety or attention deficit. May 2014 Notice of Intention to Vary the National Environment Protection (Ambient Air Quality) Measure The NEPC gives notice that it intends to make a variation to the Ambient Air Quality NEPM in relation to the standards for particles. This variation will reflect latest scientific understanding and will allow for an adequate level of health protection against the impacts of particle air pollution for the Australian community. "Prenatal exposure to pollution correlated with developmental delays at age 3, fewer IQ points at age 5, and behavior problems at 7-years-old ... when they factored in the well-documented relationship between IQ and future earnings, the researchers calculated that if the city decreased PAH pollution by a quarter, each child could earn an additional $3,382 on average." See also the peer-reviewed journal paper. May 2014 A Latrobe Valley resident believes they have been exposed to hazardous chemicals, after using ex-railway sleepers as firewood, which are highly toxic when burnt. Last week Mr Symons burnt some of the sleepers in his indoor wood heater before his family began complaining of sore throats and eyes. "We just used the sleepers, we didn't use anything else and for five hours our eyes were burning, our throats were burning," Mr Symons said. "After Mr Symons' wife searched the internet for information, she was shocked to find the sleepers were toxic if burnt and even contained fragments of asbestos originating from asbestos-made train brakes. World Health Organization Review of evidence on health aspects of air pollution – REVIHAAP Project "The scientific conclusions ... about the evidence for a causal link between PM2.5 and adverse health outcomes in human beings have been confirmed and strengthened". "The current state of scientific knowledge, supported by a large body of new studies, shows a wide range of adverse effects on health associated with exposure to PM2.5 ... The data strongly suggest that these effects: have no threshold within the ambient range studied; follow a mostly linear concentration–response function; and are likely to occur at fairly low levels, close to PM2.5 background concentrations." 6. emerging evidence that also suggests possible links between long-term PM2.5 exposure and neurodevelopment and cognitive function, as well as other chronic disease conditions, such as diabetes. April 2014 Simon Corbell urges Canberrans to swap wood heaters for gas systems With the ACT's hottest summer on record just finished, the government has turned its attention to winter and begun another crackdown on Canberra's wood heaters. April 2014.Home Firewood Burning responsible for 42% of PM2.5 emissions in Canada in 2011, compared to 8.8% for transportation (road, rail, air marine). April 2014. 9 minute video of a talk by Dr Brian Moench, President, Utah Physicians for a healthy Environment on health & woodsmoke pollution. Anyone considering a wood heater should see this! See also the follow-up video What about Woodburning Stoves - where Dr Monech reveals that he is appearing as an expert witness in a lawsuit where a neighbour is suing another neighbour because of the health consequences they have been subjected to because of the neighbour's wood-burning stove. "People can be personally exposed to 100 times more air pollution if your neighbour is burning wood. That's a really powerful effect." April 2014. Increased PM2.5 exposure of 4.1 ug/m3 during pregnancy increased risk of autism spectrum disorder by 39%. For exposure during the 3rd trimester of pregnancy, the increase was about 60%. These results were from the Harvard University Nurses Health Study. With wintertime (June, July, August) PM2.5 measurements averaging 31.8 ug/m3 in one Armidale residential area, a 60% increase in risk per 4.13 ug/m3 of exposure during the third trimester would imply a 4.6-fold increase in risk for babies born at the end of winter. See also the ABC Health Report: Pollution and autism spectrum disorder (7 April 2014). March 2014. Report highlights emissions impact of London wood burning. According to the report, the annual mean concentration of PM10 from wood burning was 1.1 micrograms per cubic metre, which it states is ‘considerably greater’ than the predicted city-wide mean PM10 reduction of 0.17 from the first two phases of the Low Emission Zone, introduced to reduce PM10 from traffic sources. Wood-burning fireplaces are suspected of driving a spike in particulate matter emissions and emergency room visits for respiratory problems in Richmond, according to a Metro Vancouver report. The regional authority’s air monitoring stations detected a spike with particulate emissions in Richmond in late November, according to the report. At the same time, Vancouver Coastal Health noticed a jump in emergency room visits “due to chronic obstructive pulmonary disease,” bronchitis, asthma and other lung conditions. Though authorities can’t be certain, the wood burning is considered a “significant contributor” to the visits and emissions spike. Breathe Utah is beginning a pilot program designed to help sole-source households convert from wood burning (and other solid fuels) for heat, to natural gas. UCAIR (Utah Clean Air Partnership) is underwriting the cost of a limited number of conversions through a new grant to Breathe Utah, entitled WSAP: Wood Smoke Abatement Program. See also: How does Utah’s bad air hurt our health? The International Agency for Research on Cancer (IARC) cited data indicating that 223,000 deaths from lung cancer worldwide resulted from air pollution in 2010, and said there was also convincing evidence it increases the risk of bladder cancer. "If you are not a smoker, burning wood is probably the greatest threat to your health as anything that you do. But it is also a threat to your neighbors' health, as inappropriate as blowing cigarette smoke in the face of the passenger in the seat next to you. More than likely your neighbors are less than enthusiastic about sacrificing their health for your freedom to burn wood. A civilized society would suggest they shouldn't have to." Brian Moench, a doctor, is president of Utah Physicians for a Healthy Environment. SALT LAKE CITY — Just as smoking cigarettes in an enclosed public place is harmful and no longer legal, a group of physicians said burning wood or coal in a fireplace or stove is a practice that has come and should go — especially in regions where Utah struggles with air quality. "It is long overdue that we consider putting wood smoke into the community airshed as inappropriate," said Dr. Brian Moench, president of Utah Physicians for a Healthy Environment. October 2013. Utah doctors call for year-round ban on burning wood. September 2013. Oil Industry and Household Stoves Speed Arctic Thaw. Gas flaring by the oil industry and smoke from residential burning contributes more black carbon pollution to Arctic than previously thought -- potentially speeding the melting of Arctic sea ice and contributing to the fast rate of warming in the region. The new study, published in the journal Atmospheric Chemistry and Physics by researchers at IIASA and in Norway, Finland, and Russia, finds that gas flaring from oil extraction in the Arctic accounts for 42% of the black carbon concentrations in the Arctic .. The warming effect of black carbon on ice and snow has been suggested as one factor contributing to the relatively fast warming of the Arctic compared to the rest of the world. Arctic sea ice has declined faster than climate models predict, hitting new record lows in 2007 and 2012. See our Greenhouse Gas page for information about the severe impact of melting permafrost on the Earth's climate. August 2013. Wood-burning stoves and fireplaces to be phased out in Montreal by 2021. Josée Duplessis, head of Montreal’s executive committee, said "We know now that heating with wood has a direct impact on the quality of air and, as a consequence, the health of Montrealers. It is not a myth but a well-documented phenomenon. City and health officials explained that wood burning leads to smog days during winter, premature deaths, hospital admissions and problems for the very young". Norman King, an epidemiologist with the Montreal Public Health Board’s urban environment and health section, said that about 1,000 Montrealers a year have their lives cut short by months or years because of fine particulate matter pollution. City counsellor Alan DeSousa explained "at first people didn’t know about the health impacts that these fine particles have, especially on those with respiratory diseases." Now that people understand the harm caused by breathing woodsmoke, phasing out this major source of pollution has much greater public support. August 2013. ABC Radio PM Wood-fired heater rules deemed too lax. TOM NIGHTINGALE: In winter, the southerly winds would trap chimney smoke in between houses in Sydney's north shore suburbs where Mark and his family used to live, and the smoke from a neighbour's heater was obvious. MARK: Really, we could smell it in our bedclothes, we could smell it inside our house. At least two of our five children get quite bad asthma, and the others get it mildly, and one of them in fact had to go onto oral steroids because their asthma got so bad with it. TOM NIGHTINGALE: After unsuccessfully raising it with his neighbour, Mark and his wife also tried the local council and then the neighbour again. But nothing changed. MARK: We would not infrequently go out on to our back veranda and there would be visible smoke within the house. You could smell it quite easily. At night time, both my wife and I but also our children had very irritated eyes and we were coughing, to the point where it made it really rather unpleasant to sleep. TOM NIGHTINGALE: The family has now moved house for other reasons, but Mark says the rules for wood-fired heaters are nowhere near good enough, and not properly enforced. MARK: I think it's very toothless. I think it's actually a significant risk for councils, because of the risks such as we experienced. If our child was admitted to a hospital, that I think is a big risk for councils that they need to take on board. August 2013. Senate Inquiry: Impacts on health of air quality in Australia. "The committee was disturbed by the disproportionate contribution made by wood smoke to urban air pollution, given the relatively small number of households using it as a heating source." 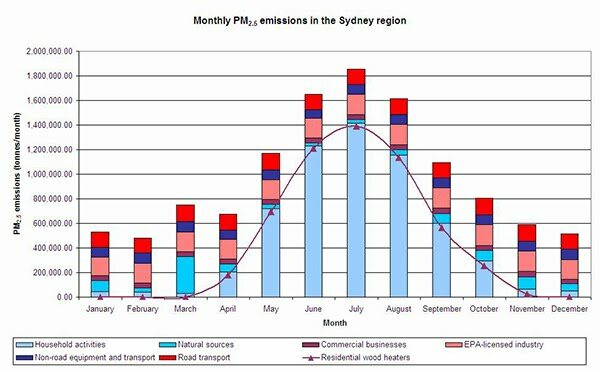 "In Sydney, improving wood heater pollution standards to 1g/kg would represent 1% of the cost of meeting the air quality targets of the NEPM, while representing 66%of the necessary abatement in PM10 levels." 6.43 The committee recommends that Australian Governments immediately adopt minimum efficiency and maximum emission standards for all newly installed wood heaters in Australia. With such large benefits for a relatively small cost, the best way to protect public health would be to base emission standards on the health cost of woodsmoke pollution. Not allowing the installation of new heaters until they have passed a strict health-based standard is the best and most cost-effective way to protect public health. The Senate Inquiry also confirmed that the failure to strengthen national woodheater standards "was the result of a failure of the technical committee to reach consensus within the meaning of Standards Australia's rules, which according to the minutes supplied to the committee was a result of opposition from industry representatives." Like many other claims made by the AHHA, this claim to the Senate Inquiry was found to be untrue. August 2013. Carbon, silicon in airborne particulates increase risk of death in US cities. "For decades, scientists have been trying to unravel why more people die of heart attacks, asthma and other health problems whenever fine particulate matter, known as PM2.5, increases. Particulates are a mix of substances emitted by sources of combustion, including cars, trucks, industrial plants and wood burning. ... The researchers from Johns Hopkins, Harvard and Yale universities used air pollution and mortality data from all causes of death, except accidents, between 2000 and 2005. Seven compounds that, together, typically make up 79 to 85 percent of PM2.5 mass were analyzed. ... With a typical, day-to-day increase in pollutant levels, deaths rose by 0.39 percent for organic carbon, 0.22 percent for elemental carbon, 0.17 percent for silicon and 0.16 for sodium. The researchers found “little evidence” of variation by season or region." These results confirm the major threat to public health resulting from the disproportionate amount PM2.5 emissions of Australian wood heaters, much of which consists of organic carbon. 25 July 2013. Dr Karl, Science on JJJ - Podcast segment: Why people in urban areas should not use woodheaters (right click the link to save and listen to the mp3 file on your computer). June 2013. NSW EPA graph showing the sources of PM2.5 in Sydney (where approximately 5% of households use wood as the main form of heating). PM2.5 - tiny particles so small they behave like gases and infiltrate homes even when all doors and windows are shut, and penetrate the deepest recesses of our lungs, are considered the most health-hazardous air pollutant, responsible for 10 to 20 times as many premature deaths as the next worst pollutant, ozone. The NSW EPA graph below shows that a small proportion of households using wood heaters is responsible for the lion's share of emissions of the most health-hazardous air pollutant - PM2.5. In 2006, a study of the health effects of particulate pollution led to press reports that Sydney's polluted air is contributing to the deaths of up to 1,400 people a year. At the time, a member of the Upper House commented: "But no one has yet given us a breakdown on where the pollution comes from - cars, airports and industrial plants." The wood heater lobby successfully diverted attention away from the real cause. With the real cause clearly shown in the NSW EPA graph, it's time for people who care about their health to demand action. The NSW Woodsmoke control options report showed that 3 simple measures - a moratorium on the installations of new heaters, a requirement to remove wood heaters before houses are sold and licencing fees could reduce the $8 billion health cost of woodsmoke in NSW by at least $6 billion. The UN Environment Program and World Meteorological Association also recommended phasing out log-burning heaters to reduce climate change as well as improve health. Now that the major source of health-hazardous PM2.5 emissions is only too clear, everyone who cares about their health should demand immediate action to implement the 3 effective woodsmoke-control measures and save $6 billion in health costs. May 2013. BBC Documentary on air pollution. Half hour BBC documentary on air pollution - mainly cars but there are some clear messages in relation to woodsmoke. 1) The dangers of PM2.5 pollution were demonstrated by measuring arterial stiffness in a volunteer who had experienced low pollution levels, then after just 1 hour exposed to high levels of PM2.5 from diesels - an important lesson for everyone to know and understand. 2) Much of the problem was created because, despite everything we knew about the dangers of PM2.5 pollution, diesels were sold as 'green cars'. Governments encouraged people to buy them by handing out tax incentives!!! The parallels with woodsmoke are only too obvious. The diesel tax incentives were a big mistake that has caused many premature deaths and substantial health problems. To save ourselves a lot of suffering, ill-health and significant costs of remediation, we should stop installing new wood heaters now, and introduce programs to get rid of the existing ones. April 2013. Michigan firefighters seek workers' comp for cancer. In May 2009, then 36-year-old Sterling Heights firefighter Chris Slezak, went to his doctor on a Monday because he felt out of shape and worn out. By that Friday, Slezak, who was active and healthy his entire life, got his first round of chemotherapy for leukemia. Slezak, whose leukemia is now in remission, said he believes it was caused by 16 years of battling burning, smoke-filled structures. April 2013. Air pollution linked to heart disease. Exposure to polluted air increases the risk of heart disease and stroke by speeding up the hardening of the arteries, according to new research. United States researchers took ultrasound measurements of the blood vessels of more than 5000 people and examined PM2.5 levels at each person's house. In findings published in PLOS Medicine on Wednesday, the researchers concluded that higher concentrations of fine particles in the air were linked to a faster thickening of the inner two layers of the common carotid artery, a blood vessel that provides blood to the head, neck and brain. Senator Di Natale said the number of Australians who died from air pollution each year was more than twice the national road toll. The director general of the United Nations Industrial Development Organization, Kandeh Yumkella recently said that globally, air pollution was causing more deaths than AIDS and malaria combined. The Australian Medical Association has told the Senate inquiry that Australia's rules do not protect human health. AMA federal president Steve Hambleton told the inquiry fine particles – which are released into the air from sources such as coal mining and the burning of petrol and wood – were particularly dangerous because they were so small they could lodge deep in the lungs. April 2013. Federal Government Consultation on New Woodheater Regulations. After many years of delays, the Federal Government has released a consultation regulation impact statement (CRIS) on proposed woodheater regulations. The CRIS admits that woodheaters are a major source of particulate (PM) air pollution - estimated at 40,000 tonnes per year, and roughly 4 times the National Pollutant Inventory estimate of PM pollution from motor vehicles. It also shows that the health costs of every new heater installed in urban areas areas amount to many thousands of dollars per year. Despite the fact that there can be no possible benefits to justify these extraordinary health costs, the best the Government could come u[ with is to introduce the regulations adopted by NZ in 2005 by 2018. A draft AAQG response to the woodheater CRIS asks why the estimated health cost of thousands of dollars per heater per year were enough to consider not allowing new wood heaters until a satisfactory health-based standard had been developed. Anyone interested in the health effects of woodsmoke should try to find time to comment on the proposals. There will be public meetings to provide an overview of the consultation RIS and how to make submissions - scheduled for Sydney, Canberra (Tuggeranong), Melbourne, Adelaide, Perth, Armidale, Launceston and Wagga - dates to be announced. Hundreds of thousands of Australians are endangering their health by the regular use of wood heaters at home. About 1 million homes regularly use wood-burning heaters, despite links to heart and lung disease. Health and environment experts are calling on the federal government to better regulate their use. In a submission to a Senate inquiry into the impact of air quality on health, a Launceston lung specialist, James Markos, said there was no safe threshold for the fine particle pollution that resulted from wood-burning heaters, just as there was no safe threshold for exposure to tobacco smoke. Along with irritating existing conditions such as asthma and emphysema, studies had found that prolonged exposure to wood smoke was an ''important environmental risk factor'' in fatal heart or lung disease or lung cancer, he said. March 2013. A fireplace pollutes the air as much as 1,000 cars. "The increase in the excise duty on heating fuel has forced a large number of Greek households to find alternative solutions, the most popular being the fireplace. According to studies, however, the burning of wood greatly increases air pollution." ... "the concentration of airborne particles on cold nights without wind reached very high levels". The highest among them were in the Thiseio region in the centre of Athens, where they reached 100 micrograms per cubic metre and in the centre of Patras with more than 200 micrograms per cubic metre. The experts make a comparison with the annual average concentrations of PM2.5 in the European Union, which is 20 ug per cubic metre. In Utah, where particle pollution tends be higher during winter months for various reasons, such as "more frequent and severe temperature inversions; more space heating, including wood burning” a group of Utah doctors are advising prospective parents to wait until the inversion season is over before trying to conceive. "A growing body of research is linking air pollution to negative birth outcomes, most often prematurity, low birth weight and restricted growth in the womb. .... Low birth weight is linked to problems in later childhood, including impaired intellectual ability, elevated blood pressure, diabetes and obesity." February 2013. US EPA Green Heart Month The US EPA is raising awareness of heart disease and its link to air pollution and other environmental factors. Diane Powers, of the city’s building safety division, said ... she’s received about 20 inquiries into installing outdoor wood boilers over the past five years. She’s denied each request without pushback. "More than one hundred members of the Utah Physicians for a Healthy Environment held a press conference at the Utah Capitol on Wednesday, delivering a letter in which they say Utah’s air is dangerous. "They say their patients are dying prematurely and pregnant women are having complications, and that the dirty air is having an impact on everyone, one way or another. “Some women who are pregnant right now are going to miscarry, some women who are pregnant right now are going to develop preeclampsia and a few more babies are going to be born prematurely because of these five days in this bad month,” said Dr. Kurtly Jones, doctor of reproductive medicine. "But the risk isn’t just for the pregnant, elderly or certain high-risk people, it’s hurting everyone, so much that it should be considered a public health emergency. "The UPHE delivered a letter to the Governor’s Office offering a list of suggestions. The list suggests such actions as reducing highway speed limits to 55 mph, making mass transit free for the remainder of the winter season, requiring industrial polluters to cut production by 50 percent and completely prohibiting wood burning. January 2013. Climate change: Soot's role 'underestimated' says study "Scientists say that particles from diesel engines and wood burning could be having twice as much warming effect as assessed in past estimates. They say it ranks second only to carbon dioxide as the most important climate warming agent .... This new study concludes the dark particles are having a warming effect approximately two thirds that of carbon dioxide, and greater than methane." "Reducing emissions from diesel engines and domestic wood and coal fires is a no-brainer as there are tandem health and climate benefits," said Professor Piers Forster from the University of Leeds. "If we did everything we could to reduce these emissions we could buy ourselves up to half a degree less warming, or a couple of decades of respite," he added." The Australian, 9 January 2013. "REDUCING the use of wood-burning stoves in Launceston led to a sharp fall in deaths from respiratory diseases and heart failure, a study published today says. "The paper, published by the British Medical Journal, highlights the pollution risks from inefficient biomass burning, used by billions of people for heating and cooking. "University of Tasmania researchers looked at what happened when the city implemented a scheme to reduce pollution from wood smoke. "It launched a campaign to educate residents about the risks of smoke from wood-burning stoves and offered help to replace these with electric ones. "From 2001 to 2004, the number of households that used wood-burning stoves fell from 66 to 30 per cent. Atmospheric pollution from air particulates during winter fell by 40 per cent. "Deaths among men fell by 11.4 per cent, particularly from cardiovascular causes, which saw a decline of 17.9 per cent, and from respiratory causes, which retreated by 22.8 per cent ..."
January 2013. Launceston's $2 million woodsmoke-reduction program halved wood heater use and reduced wintertime deaths from cardiovasular diseases by 20% and respiratory deaths by 28%. With such tremendous benefits from reducing wood heater use to 30%, how many people would like to see another 20-28% reduction in cardiovascular and respiratory deaths by persuading the remaining 30% of households to convert to non-polluting heating? Who wouldn't value the benefits of a 20-28% reduction in cardiovascular and respiratory deaths at much more than the cost of converting the remaining 30% of households to non-polluting heating? Study highlights: "The interventions dramatically accelerated a general trend towards using electric rather than wood heaters. Following the interventions wood heater prevalence fell from 66 per cent to 30 per cent of all households and the three month average particulate air pollution during winter was reduced by 40 per cent. “The difference between deaths in 1994-2001 and 2001-2007 were statistically significant in men: differences of 11.4 per cent for all-cause mortality; 17.9 per cent for cardiovascular and 22.8 per cent for respiratory. “Results taken during the winter months (June – August) for males and females combined showed even higher reductions: cardiovascular 20 per cent; respiratory 28 per cent." So, halving wood heater use reduced wintertime deaths from cardiovasular diseases by 20% and respiratory deaths by 28%, with total deaths per year in males falling by 17.9% for cardiovascular, 22.8% for respiratory. With such tremendous benefits from reducing wood heater use to 30%, who wouldn't want to see another 20-28% reduction in cardiovascular and respiratory deaths by persuading the remaining 30% of households to convert to non-polluting heating? November 2012. PM2.5 pollution reduces cognitive function in older adults. A study by the US EPA measured cognitive function by a series of tests assessing word recall, knowledge, language, and orientation in of 14,793 subjectsaged 50 and oever. A 10 ug/m3 increase in PM2.5 was associated with a 0.36 point drop in cognitive function score, roughtly equal to three years of aging. November 2012. NSW Government Consultation on Woodsmoke Control Options. The latest NSW emissions inventory (2008 data) estimates that wood heaters, used by less than 4% of households in Sydney are responsible 51% of all Sydney's all man-made PM2.5 emissions. Wood heaters therefore contribute a substantial proportion of the 643 to 1446 premature deaths attributed to particle pollution each year in Sydney. The EPA discussion paper is an opportunity to introduce much-needed controls to reduce the health impact of wood heater pollution in urban areas. A briefing paper has been prepared in co-operation with Cate Faehrman, MLC, including background information and some suggested responses to the discussion paper questions. Everyone concerned about woodsmoke should consider making their views known to balance the misleading information put out by the AHHA on behalf of the Australian wood heating industry. Background paper, explaining why the current geneneration of wood heaters, which have estimated health costs of $4436 per year in Sydney (and $1562 per year in rural areas) is totally unacceptable. The best option is therefore to adopt the policy that is successfully reducing woodsmoke in Christchurch, NZ. Christcurch's emissions limit is 1.0 g/kg, with new heaters allowed only as replacements for existing, more polluting, wood heaters. Instead of carrying out the same deceptive practices as the tobacco industry, the Australian Wood heating industry and its representatives (the AHHA) should immediately work on introducing develop technology (e.g. gas boosted ignition and sensors to boost the airflow or switch on the gas booster when the temperature falls below what is needed to burn up the smoke pollution). This would allow people to install and use wood heaters without damaging the health of the community. Wood-burning heaters make a substantial contribution to air pollution in NSW. Smoke from wood-burning heaters can affect your health. Long-term exposure can cause heart and lung disease while brief exposures can aggravate asthma or worsen pre-existing heart conditions. Use of a wood-burning heater will affect the air quality inside your home and the surrounding environment. Aug 2012. Armidale's woodsmoke pollution worse than previous years. 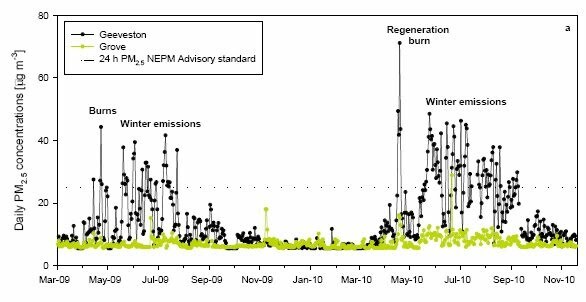 The graph below shows that Armidale's woodsmoke pollution in 2012 was higher than the same months in previous years, implying that attempts to reduce woodsmoke in Armidale have failed. This is hardly surprising. New diesel vehicle standards were introduced to protect our health. We need a similar approach for wood heaters. Armidale’s current standard is so lax that the average brand new woodheater emits more particle pollution year than 350 utes or 4WD satisfying the new diesel standards. Until the authorities insist on a health-based standard for woodheater emissions, as they have done for vehicle emissions, woodsmoke will remain the largest single source of air pollution. In the ACT, for example, less than 4% of households use wood as the main form of heating, but woodheaters are responsible for 71% of annual PM10 emissions. Aug 2012. Fish oil lowers air pollution risk A study exposed healthy volunteers for 2 hours to 278 ug/m3 of PM2.5 pollution – similar to pollution in some Armidale residential areas on a still night - after they had taken 3 g of either fish or olive oil for a month. When the olive oil group breathed the polluted air, two key indicators of heart health were affected - levels of fats in the blood linked to heart disease increased and heart rate variability decreased. These indicators did not change in the group that had taken fish oil, suggesting that fish oil can help reduce the risks of breathing polluted air. Wood heaters will be banned in the new residential suburbs of the Molonglo Valley, with the government citing threats to air quality in the large new development.The wood heaters will be prohibited in Coombs and all future suburbs in Molonglo Valley, but the existing suburb of Wright will be exempt.The decision follows the release of the annual Air Quality Report for 2011, which identifies domestic wood heaters as the biggest source of air pollution in the ACT. Wood heaters are already banned in Dunlop and East O'Malley, according to Environment Minister Simon Corbell. "We know that wood smoke can be a problem in the ACT which is why the Government recently launched the "Burn Right Tonight" campaign to raise the public awareness of correct wood heater operation," he said. "Homeowners who use wood heaters could be slapped with a $1300 fine if their chimneys are spotted blowing visible smoke for more than 10 minutes. Under state pollution control laws, anyone with smoke coming out of their chimneys for this time can expect a visit from an environmental officer, who will instruct them to modify either their heater or chimney within 21 days. "Failure to comply would see the homeowner receive a fine of up to $1300. A state government spokesman said the move was the first phase of a wider effort to control domestic wood heater emissions, with Launceston and Hobart the focus for the project." June 2012. ACT Greens launch wood smoke initiative “The ACT Greens proposals are about reducing pollution and its corresponding health and environmental problems, to ensure a clean and healthy future,” said ACT Greens Health Spokesperson Amanda Ms Bresnan. This Discussion Paper is a big step forward compared to the existing policy in NSW. Last year, the Federal Government announced new vehicle standards, which are expected to save $1.5 billion over 20 years, at a cost of $980 added to the price of a new diesel ute/4WD. Woodsmoke is an $8 billion health problem in NSW, according to a NSW Government report. This works out at more than $22,000 for every wood heater in the state. The reportconcluded that even simple measures such as requiring wood heaters to beremoved when houses are sold could save an estimated $4 billion in NSW, for arelatively minor cost of $36 million (see Tables 26 and 28). If we can crackdown on vehicle pollution - why not the equally dangerous pollution from wood heaters? The average new wood heater emits as much health-hazardous PM2.5 pollution as several hundred diesel cars or 4WD that satisfy the new standards. April 2012. PAH exposure linked to behavioural problems - anxiety, depression and attention difficulties in young children. This study adds to previous studies by relating child behaviour scores both to the PAH exposure of the mothers, and to genetic damage (measurement of DNA adducts specific to benzo[a]pyrene (BaP), a representative PAH), in maternal and umbilical cord blood. Although BaP became famous as the chemical in the "every cigarette is doing you damage" TV adverts, burning 1 kg wood in a correctly-operated Australian wood heater emits as much BaP as in the smoke from 27,000 cigarettes. When BaP was measured at the Armidale creeklands, wintertime BaP averages of 1.30 n/gm3 were much higher than the negligible levels of 0.02 ng/m3 in summer, and much higher than winter measurements in Sydney (0.14 in Richmond, with higher levels in areas such as Blacktown (0.43) where wood heater use is more common, or with higher levels in Earlwood and the the CBD (0.76-0.77). Sydney's summertime PAH were also negligible (0.02-0.05). April 2012. More evidence that woodsmoke exposure reduces IQ of children starting school. "Two new studies led by University of California, Berkeley, researchers spotlight the human health effects of exposure to smoke from open fires and dirty cook stoves, the primary source of cooking and heating for 43 percent, or some 3 billion members, of the world's population. Women and young children in poverty are particularly vulnerable. In the first study, the researchers found a dramatic one-third reduction in severe pneumonia diagnoses among children in homes with smoke-reducing chimneys on their cook stoves. The second study uncovered a surprising link between prenatal maternal exposure to woodsmoke and poorer performance in markers for IQ among school-age children." Given the evidence that in developed countries exposure to toxic chemicals known as PAH (Polycyclic Aromatic Hydrocarbons), measured during the third trimester of pregnancy also reduces the IQ of children starting school, and with the average wood heater producing many more PAH than the average car, this result is perhaps not that surprising. March 2012. Wood Stoves Linked to Trace Levels of Heavy Metals. This again suggests that woodsmoke is no more benign than other forms of pollution, e.g. traffic pollution. March 2012. 'High' PAH exposure during pregnancy is linked to epigenetic changes of the gene ACSL3 at birth and increased likelihood of developing asthma before the age of 5. In this study, 'high' PAH exposure was defined as exposure to more than 2.41 ng/m3, about a quarter of Armidale's average wintertime PAH of 8.62 ng/m3 (max 24.0 ng/m3). The same study that found a link between exposure to more than 2.26 ng/m3 of PAH during the third trimester of pregnancy was associated with a 5 point reduction in IQ when the children started school. Although traffic is often blamed for high PAH pollution, even in Sydney's mild climate the average woodheater produces about 10 times as much PAH pollution per year as the average passenger car. In areas where woodheaters are used on more days per year, or there is less traffic, the average woodheater is likely to emit 50 times as much PAH pollution as the average car. In Canberra, for example, the 3.9% of households with woodheaters emit two thirds of all PAH pollution, with only a third from vehicles. March 2012. Last year, the NSW State Government announced a $450,00 study to install additional pollution monitors in Muswellbrook and Singleton. Unfortunately, it has so far declined to help fund pollution monitoring in Armidale, despite the generally higher pollution readings (see graph below), and substantial periods of time when no data are available due to communication problems. Are funds being allocated on the basis of need, or political expediency? PM2.5 are the most health-hazardous air pollutant, estimated to be responsible for about 10 to 20 times as many premature deaths as the next worst pollutant, ozone. Studies show that PM2.5 from woodsmoke are at least as hazardous as PM2.5 from other sources. A recent OEH report concluded that woodsmoke in an $8 billion health problem in NSW. 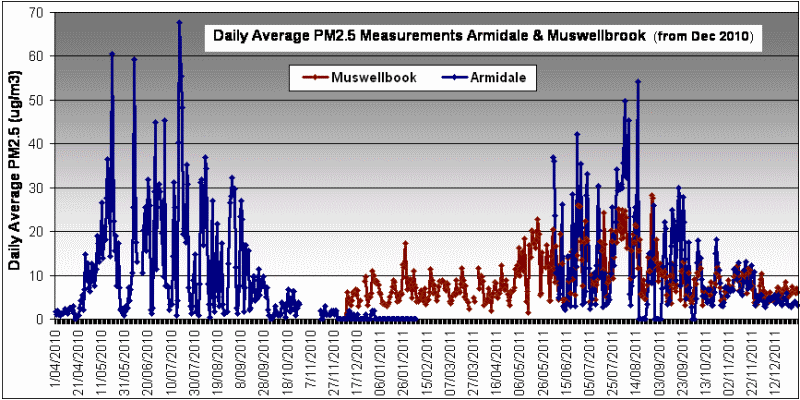 Armidale has a similar seasonal pattern of PM2.5 pollution, but with many more exceedences of the PM2.5 standard than Muswellbrook - see graph above. The public currently has no access to pollution measurements in Armidale, because of failure of the analog transmitter on the DustTrack at Civic Adminstration Building. Council should remind the NSW Government that funds should be allocated according to need. Given Armidale’s higher pollution measurements, the NSW Government should also be asked to provide increased funds for woodsmoke reduction. February 2012. Air pollution hastens cognitive decline. Several years ago a massive survey of began collecting data on memory, thinking skills and other cognitive measures. Jennifer Weuve of the Rush Institute of Healthy Aging in Chicago combined that data with information on air quality. She compared the level of particulate matter in the air with the change in cognitive scores over several years. "The most important finding of our study is that women who were exposed to higher levels of ambient particulate matter over the long term experienced more decline in their cognitive scores over the four-year period that we followed them up." The study found that a a 10-μg/m3 increment in long-term PM exposure was cognitively equivalent to aging by approximately 2 years. Weuve says the tiny particulates in the air might be getting into the brain directly. They're so small - 10 microns, one-thousandth of a millimeter - that they can evade the body's usual defenses and may be able to reach the brain either via the lungs or through the sinus passages in the head. "Several studies have found that these particles - at least some of them - can actually get into the brain where they can cause inflammation and might even trigger some of those microscopic changes that are typical of Alzheimer's Disease." Or it may be a more indirect effect. Numerous studies have identified an association between air pollution and cardiovascular disease, and the cognitive decline may be a result of damage to the blood supply. For example, research published in the same journal as Weuve's paper, the Archives of Internal Medicine, found a higher risk of stroke on days when there were more particulates in the air. January 2012. Paper on climate change, health, methane and black carbon published in Science. Phasing out log-burning heaters in developed countries is one of a package of 14 measures to reduce global warming by reducing methane (CH4) and black carbon (BC) emissions. The graph from the latest UNEP report (November 2011) shows the effect of the measures on global temperatures. Compared to the purple Reference line (business as usual) the dark blue line shows the effect of the proposed measures - a significant reduction in global temperatures, starting immediately and achieving a reduction of about 0.4 degrees by 2040, complementing initiatives to reduce CO2 emissions. Benefits from the measures to reduce CO2 accrue about 2040. By about 2070, half the reduction is due to the reductions in methane and black carbon emissions and about half due to the reduction in CO2 emissions. December 2011. Video presentation by Dr Brian Moench (Utah Physicians for a Healthy Environment) on how air pollution affects the brain and leads to epigenetic damage that can affect the health of future generations. December 2011. Woodsmoke in NSW is causing an $8 billion health problem - Consultants' Report for the NSW Office of Environment and Heritage. With about 372,203 heaters in NSW (Table 17 of the report), this works out at $21,687 per heater. The cost-benefit analyses show that requiring all heaters (even new ones) to be removed whenever houses are sold will save $4,015 million in health costs - a net benefit of $3,978 million after subtracting costs of $36 million (see Table 28). A ban on the sale of new heaters is the next most cost-effective option, resulting in health benefits of $2,206 million, a net benefit of $2,071 million after subtracting costs of $134 million. The large benefit from not allowing new heaters to be installed is because their real-life emissions (9.8 grams per kg of fuel) are little different to older models. In fact, the average new wood heater in Sydney burns 1.9 tonnes of wood per year, so emits 18.6 kg of fine particle pollution, with estimated health costs (using the standard costing of $235.26 per kg of emissions) of $4,380 per year. With the latest scientific studies shows that air pollution is worse for our health than previously thought - causing brain damage and epi-genetic damage that can affect the health of future generations, it's time for a re-think about using woodheaters in urban areas. October 2011. PAH and PM2.5 exposure increases the risk of pre-term birth "Odds of preterm birth increased 6-21% per inter-quartile range increase in entire pregnancy exposures to organic carbon (OC), elemental carbon (EC), benzene, and diesel, biomass burning and ammonium nitrate PM2.5, and 50% per inter-quartile increase in PAHs ... PAHs as a pollutant of concern should be a focus of future studies. Other PAH sources besides traffic were also associated with higher odds of preterm birth". This study, located in California, had relatively low levels of PAH, e.g. 0.13 ng/m3 of benzo(a)pyrene (BaP). Although Armidale had even lower BaP in summer (0.02), Armidale's wintertime average of 1.30 ng/m3 (max 3.77) was 10 times worse than California, implying that living in an area affected by woodsmoke is likely to increase the risk of pre-term birth as well as genetic damage in babies and reduced IQ when children start school. September 2011.The review into Australia's air quality standards recommended that the desired outcome should be to "minimise the risk from adverse health impacts from exposure to air pollution for all people wherever they may live" and that the goal should include incorporation of exposure reduction targets for priority pollutants, and revising that standards for all air pollutants to take into account new evidence around the health effects of air pollution. The report notes that "current standards are not meeting the requirement for adequate protection of human health." The report notes that:" An analysis of the monitoring data ... did not present any clear trends, with the exception of two cases: one being the reduction in ambient lead due to its removal from motor vehicle petrol, and the other being reductions in particle levels in Launceston through domestic wood heater incentive and education campaigns." 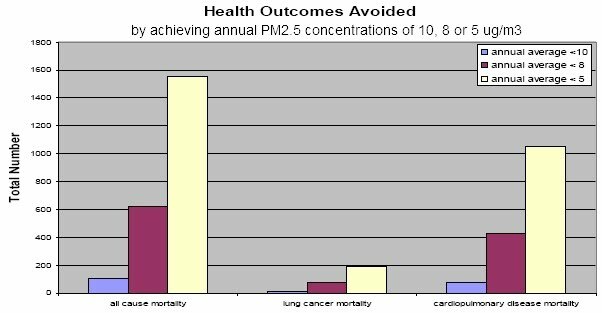 The graph below was produced in 2002 as part of the impact statement for introducing a PM2.5 standard. It shows numbers of premature deaths from PM2.5 pollution for annual averages of 5, 8 and 10 ug/m3. Nearly 1,000 lives could be saved every year by reducing the target from 8 to 5, with smaller reductions, e.g from 8 to 7, still resulting in substantial benefits. The report also states: "When the NEPM was made, there was a commitment to initiate a full review of the NEPM in 2005." Although a thorough review is necessary, the length of time it will take to set new standards is regrettable. Given the acknowledgement that "current standards are not meeting the requirement for adequate protection of human health", perhaps interim or provisional targets could be set? With no clear trend of reducing PM2.5 levels, calculating estimated costs per kg of avoided emissions could be used to identify the most cost effective ways to reduce PM2.5 pollution. With woodsmoke the largest single source of PM2.5 in most Australian cities despite being used by a relatively small proportion of households (e.g 71% of particle emissions in the ACT from 3.9% if households), reducing wood heater use would almost certainly be identified as the cheapest way to reduce PM2.5 emissions. Rather than wait for the full report, action now would reduce PM2.5 pollution and help prevent the premature deaths of many Australians who would otherwise die from PM2.5 exposure before the NEPC revises and implements the new standards that it says are necessary to protect our health. A temporary injunction not to burn was made permanent, after a court case where homeowner DeSantis agreed to a restrictive covenant on his property that prohibits him or any subsequent owner to ever burn and produce smoke. In addition, DeSantis must pay his neighbours, the Brandies $50,000. Shirley Brandie said the smoke made being outside impossible. It even permeated her home despite her keeping her windows closed tight. Her eyes burned, her throat hurt and she felt dizzy all the time. According to his lawyer, DeSantis, 77, is suffering from "mental deterioration" and would not have been able to testify at trial. With new research showing that long-term exposure to PM2.5 pollution can lead to learning and memory problems, physical changes in the brain, and even depression, perhaps this will be a lesson to all who use wood heaters at the expense of a neighbour's health. A series of increases in fine particulate matter pollution readings at Muswellbrook has reignited concerns about Upper Hunter air quality. ‘‘The high readings occurred overnight during cool and calm conditions which is conducive to particulate build-up and characteristic of the type of particle matter expected from fuel combustion, including woodsmoke,’’ a spokeswoman from the Office of Environment and Heritage said. Upper Hunter Air Quality Monitoring Network advisory committee member Carol Russel said ‘‘If woodsmoke is contributing to dust problems it means the government has a major problem that needs to be addressed. ’September 2011. Controlling soot could reduce warming above parts of the Arctic Circle by almost 3 degrees Fahrenheit within 15 years - continued melting of sea ice above the Arctic Circle will be a tipping point for Earth's climate, a point of no return. ScienceDaily report, Sep. 1, 2011: At the 242nd National Meeting & Exposition of the American Chemical Society (ACS), Mark Z. Jacobson, Ph.D., cited concerns that continued melting of sea ice above the Arctic Circle will be a tipping point for Earth's climate, a point of no return. That's because the ice, which reflects sunlight and heat back into space, would give way to darker water that absorbs heat and exacerbates warming. And there is no known way to make the sea refreeze in the short term. Jacobson's calculations indicate that controlling soot could reduce warming above parts of the Arctic Circle by almost 3 degrees Fahrenheit within 15 years. That would virtually erase all of the warming that has occurred in the Arctic during the last 100 years. "No other measure could have such an immediate effect," said Jacobson, who is with Stanford University. "Soot emissions are second only to carbon dioxide (CO2) in promoting global warming, but its effects have been underestimated in previous climate models. Consequently, soot's effect on climate change has not been adequately addressed in national and international global warming legislation. Soot emissions account for about 17 percent of global warming, more than greenhouse gases like methane. Soot's contribution, however, could be reduced by 90 percent in 5-10 years with aggressive national and international policies." August 2011.CSIRO Study: Impacts of smoke from regeneration burning on air quality in the Huon Valley, Tasmania The study measured PM2.5 pollution in Grove, a rural area, exposed only to forestry burns and Geeveston, a small town with 277 houses, exposed to smoke from domestic wood heaters as well as forestry burns. The difference is shown in the graph below. Although there is some pollution from forestry burns in Grove, the vast majority of the pollution in Geeveston is woodsmoke from domestic heating. Because most people live in towns, people shop there children go to school there, people are exposed to high levels of toxic smoke pollution. The forestry burns led to one exceedence of the the PM2.5 standard in Grove. In Geeveston, the PM2.5 standard was exceeded on 99 occasions. The graph below compares the two - Grove (light green) has relatively low pollution. The 277 houses in Geeveston create a massive, unhealthy pollution problem every winter. As in Launceston, funds should be made available as a matter of urgency to replace wood heaters with gas or reverse cycle electric heating to protect residents' health. August 2011. Montreal earmarks $6 million to end wood burning. Studies have shown that neighbourhoods where woodburning is common have increased hospital admissions for asthma attacks and other respiratory ailments, and that this type of air pollution causes premature death. Montreal outlawed new installations of wood-burning stoves and fireplaces two years ago. At the time, critics said this would only stop an already intolerable problem from getting worse. Alan De Sousa, the city's executive committee member responsible for environmental issues, said "Our first step was to cap the growth in wood-burning appliances, and this new funding from the province will allow us to introduce a rebate program to start to make a dent in the number of wood stoves and fireplaces already installed." Sidney Ribaux of Equiterre said the goal is the removal or replacement of as many of these appliances as possible. "If you consider that using a wood-burning stove for nine hours generates the same quantity of fine particles as a car does in one year, you can understand that this program will make a major improvement in Montreal's air quality." August 2011. Is Muswellbrook's domestic heating causing high wintertime PM2.5? The graph (left) shows PM2.5 pollution in NSW Muswellbrook, a centre of the NSW coal mining industry. PM10 and PM2.5 monitors were installed in late 2010. The PM10 monitor revealed the presence of some coarse particles, most likely caused by mining. However PM2.5 pollution (which causes much more serious health damage than particles between 2.5 and 10 microns) was reasonably low and remained so until the start of the heating season - see graph (click on it to enlarge). Does this mean that, even in towns noted for their mining activity, the main source of health-hazardous PM2.5 particles is domestic heating? A Press Release from the NSW Office of Environment and Heritage notes: "Higher concentrations of the smaller PM2.5 particles were measured in the late evening and early morning at Muswellbrook and Singleton and were characteristic of the type of particle matter expected from home woodheaters." July 2011. PAH exposure linked to neural tube defects such as spina bifida in newborns. Research in China, published in the National Academy of Science shows an increased risk of neural tube defects when certain PAH are found in the placenta. The risk of a defect was 4.5 times greater where the levels of PAHs were above the average of 597 nano-grams per gram of lipid. As the amount of PAHs in the placenta rises, that risk rises also, to over 11 times the risk of a defect in the cases with the highest levels of PAHs. This 'dose-response' relationship strongly suggests that PAH a causal factor. Woodsmoke pollution is a major source of PAH emissions in Australian cities. In Canberra, where only the 3.9% of households use woodheating, woodheaters are responsible for two thirds of PAH emissions (NPI data). In Armidale, wintertime PAH measurements averaged 8.62 ng/m3 (max 24.0 ng/m3) - about 4 times higher than 2.26 ng/m3 above which children in a New York study were found to have a 5 point reduction in IQ on starting school. Perhaps the two are linked, with PAH exposure linked to damage of both neural tube and brain cells. While other studies have shown the damaging effects of polluted air on the heart and lungs, this is one of the first long-term studies to show the negative impact on the brain. In previous studies in mice, the Davis research group -- including Qinghua Sun, associate professor of environmental health sciences, and Sanjay Rajagopalan, professor of cardiovascular medicine -- found that fine air particulate matter causes widespread inflammation in the body, and can be linked to high blood pressure, diabetes and obesity. In the new study, mice were exposed to either filtered air or polluted air for six hours a day, five days a week for 10 months -- nearly half the lifespan of the mice. The polluted air contained fine particulate matter (PM2.5). These particles can reach deep areas of the lungs and other organs of the body. "We wanted to look carefully at the hippocampus because it is associated with learning, memory and depression," said Fonken, who, along with Nelson, are also members of Ohio State's Institute for Behavioral Medicine Research. Results showed clear physical differences in the hippocampi of the mice who were exposed to polluted air compared to those who weren't. Mice exposed to polluted air had fewer spines in parts of the hippocampus, shorter dendrites and overall reduced cell complexity. "The hippocampus is particularly sensitive to damage caused by inflammation," Fonken said. "We suspect that the systemic inflammation caused by breathing polluted air is being communicated to the central nervous system." "Demi Brown, you are welcome to come to my house in winter and see and smell the smoke pollution your wood heaters pump out. My health is affected, my property has a smokey burnt smell for months on end, I can't have a single door or window open, I can't go outdoors when I choose. I don't give a stuff about carbon footprints - it's good old fashioned air pollution that concerns me. Why don't I move? I can't afford it. Where can I go and be guaranteed more stinking smoke stacks won't be installed around me? The moon? Bring on a class action against the AHHA, I'll be one of many who will gladly join it. Woodsmoke is so bad for our health that experts including the Australian Lung Foundation and the American Lung Association tell us to use non-polluting alternatives whenever available. The UN and the World Meteorological Association tell us to phase out woodheating to reduce climate change. June 2011. Armidale Independent gives "thumbs down" for not controlling wood smoke issues in Armidale and the effect on residents health (see image on right). June 2011. UN report recommends phasing out wood-burning stoves in wealthy countries and banning open burning of agricultural waste to reduce global warming. A report, written by 50 scientists from the United Nations Environment Program (UNEP) and the World Meteorological Organization (WMO) recommends a package of measures to reduce global warming, including phasing out woodheaters in developed countries. Methane, ground-level ozone and black carbon cause about half of current global warming. The report calls for immediate action to reduce these emissions to help limit global temperature rises over the next 20 years that could lead to catastrophic climate change from melting of glaciers and polar icecaps (that reflect radiation back into space) as well as methane permafrost and frozen sub-sea methane, which have been described as a "ticking time bombs" for our climate. According to the latest IPCC report, methane causes 25 times as much global warming as the same amount of carbon dioxide. The world has warmed by about 0.8˚C from pre-industrial levels. Full implementation of the identified measures would reduce future global warming by 0.5˚C. If the measures were to be implemented by 2030, they could halve the potential increase in global temperature projected for 2050 compared to the Assessment’s reference scenario based on current policies and energy and fuel projections. This may be enough to prevent the release into the atmosphere of frozen sub-sea and permafrost methane and leading to runaway global warming. Cutting out these pollutants now could also boost global food output and save millions of human lives lost to heart and lung disease, according to the report from the UN Environment Program (UNEP) and the World Meteorological Organization (WMO). Parallel action now on black carbon particles and ground-level ozone would buy precious time in limiting projected global temperature increases of 3.6 degrees Fahrenheit in the coming decades, the report said. Recommended procedures for cutting methane, ozone pre-cursors and black carbon include the use of mandatory diesel filters on vehicles, phasing out wood-burning stoves in wealthy countries, use of clean-burning biomass stoves for cooking and heating in developing nations, and a ban on the open burning of agricultural waste. May 2011. First concrete laboratory evidence for a link between acrolein and multiple sclerosis. Burning 1 kg of wood in an Australian wood heater produces as much acrolein as in the smoke from 880 cigarettes. May 2011. Chemical in woodsmoke a threat to health A hidden danger in wood and tobacco smoke could be contributing to health problems such as cataracts, arthritis and heart disease, scientists have revealed. In the body isocyanic acid, described by the chemical formula HNCO, is part of a biochemical pathway linked with cataracts and inflammation that can trigger cardiovascular disease and rheumatoid arthritis. "We also demonstrated that it dissolves readily in water, which means that humans can be exposed directly if it gets into eyes or lungs." At about 1 ppbv, the research team calculated that enough HNCO would dissolve into exposed tissues -- lungs and eyes -- that those tissues could be vulnerable to "carbamylation," part of the chemical process triggering inflammation and cataract development. People could experience higher exposure to HNCO near wildfires or in indoor environments where coal, wood or other biomass is burned for heating or cooking. May 2011. Exposure to black carbon (found in wood and diesel smoke) and sulphate alters gene expression. Researchers examined the effects on DNA methylation of long-term (90 days) exposure to common air pollutants in a large population of elderly men living in the greater Boston area. Exposure to black carbon and sulfates over the 90 days before measurement was associated with decreases in DNA methylation. Table 2 of the paper shows that increased black carbon in the air during the previous 28, 45 and 60 days siginficantly reduced DNA methylation of the Long Interspersed Nucleotide Element-1(LINE1). Increased black carbon in the air during the previous 45, 60 and 90 days siginficantly reduced DNA methylation of the short interspersed nucleotide element, Alu. Increased sulphate during the previous 90 days also reduced LINE1 methylation, but there had no effect on Alu. People with one particualr gene (GSTM1 null genotype) were more affected than others. These decreases may lead to changes in gene expression and altered risk for diseases that become more common with aging. Based on their results, the authors suggest these air pollutants "should remain a regulatory concern," though further studies are needed to determine if the epigenetic changes contribute to heart or other disease. April 14, 2011: Professor Ross Garnaut, distinguished Australian economist and author of a review on Climate Change and Policy Response to Climate Change for the Federal, State and Territory governments of Australia, gave a lecture on Climate Change in Armidale, NSW. When asked about how to account for biomass climate change policy, he argued that people who grow trees, should get credits for the carbon sequestered every year. But people who chop them down (and burn them) should pay tax on the carbon released into the atmosphere. This sensible accounting system (which relates directly to the impact on the atmosphere - sequester carbon and get credit; pay the tax when it is burned) correctly puts wood heating as a much greater cause of global warming than other forms of heating. Methane should still be counted, as it is now, but the release of the CO2 dominates. Applying the same carbon accounting system to forestry burn-offs might encourage other uses to be made of forest biomass, result in substantial reductions in air pollution as well as global warming. April 2011. Long-term studies show PM2.5 pollution is more deadly than previously thought. An additional of 10 ug/m3 of PM2.5 exposure (less than the increase from woodsmoke in Armidale) increased cardiovascular disease by 24% and cardiovascular deaths by 76%. Apr 2011 Air pollution and breast cancer. Three recent studies have linked air pollution to breast cancer. 1) Exposure to air pollution early in life and when a woman gives birth to her first child may alter her DNA and may be associated with premenopausal breast cancer later in life, researchers at the University at Buffalo have shown. The study, based on data from the Western New York Exposures and Breast Cancer (WEB) study, collected information from 1,170 women with recently diagnosed breast cancer and 2,116 healthy women who lived in New York's Erie and Niagara counties between 1996 and 2001. "The investigation looked for an association between exposure to pollution and alterations to DNA that influence the presence or absence of key proteins. Such genetic changes are thought to be major contributors to cancer development and progression, including at very early stages," said lead investigator Katharine Dobson, MPH. 2) Mexican women who do not smoke but are exposed to smoking are at three times higher risk for breast cancer than non-smoking women not exposed to passive smoking, according to findings presented at the Third AACR Conference on The Science of Cancer Health Disparities, being held Sept. 30-Oct.3, 2010. Although this focussed on environmental tobacco smoke, research suggests that the pollutants in wood smoke have a much greater biological impact in the human body compared to cigarette smoke or even automobile exhaust on a per unit weight basis. 3) Researchers from The Research Institute of the MUHC (RI MUHC; Dr. Mark Goldberg), McGill University (Drs. Goldberg, Dan Crouse and Nancy Ross), and Université de Montréal (Dr. France Labrèche), links the risk of breast cancer - the second leading cause of death from cancer in women - to NO2 pollution. "We've been watching breast cancer rates go up for some time, "says study co-author Dr. Mark Goldberg, a researcher at The RI MUHC. "Nobody really knows why, and only about one third of cases are attributable to known risk factors. Since no-one had studied the connection between air pollution and breast cancer using detailed air pollution maps, we decided to investigate it." The paper talks about emissions, including "gases, particles, volatile organic compounds, and polycyclic aromatic hydrocarbons (PAHs), many of which are accepted or potential carcinogens. Benzene, for example, is present in gasoline, is an accepted human carcinogen (International Agency for Research on Cancer 1987), and has been shown to cause mammary carcinomas in rodents (Huff et al. 1989; Maltoni et al. 1988, 1989). Exposure to other aromatic hydrocarbons associated with gasoline, including kerosene, toluene, and xylenes, has also produced increased rates of mammary cancers in female rats (Maltoni et al. 1997). Aromatic hydrocarbons are lipophilic and may therefore reach elevated concentrations in breast tissue and promote carcinogenesis in the cells of the breast (Morris and Seifter 1992)". The researchers suggested that their NO2 measurements were an indicator of traffic pollution, but NO2 is also emitted by wood heaters, as are most of the other toxic chemicals listed above. According to John Gras' study of wood heater emissions, the best estimate is about 0.44 grams of NO, 0.18 grams of NO2 and 0.62 g of NOx are emitted for every kg of firewood burned. Nox mission limits for petrol cars are 0.15 g/km (Euro-3), 0.08 g/km (Euro-4) and 0.07 g/km (Euro-5). Montreal banned the installation of new woodheaters because they account for 47% of Montreal’s PM2.5 pollution, including 45 winter days from Nov 2008 to March 2009 with PM2.5 levels exceeding the standard. With the average woodheater emitting far more NO2/NOx in urban areas than the average passenger car, the link between NO2 and breast cancer could well be related to woodsmoke exposure as well as exposure to the same and similar chemicals from traffic emissions. Apr 2011 Polluted Air Leads To Disease By Promoting Widespread Inflammation. Another group of researchers at Ohio State University have shown that breathing polluted air can also cause widespread inflammation by triggering the release of white blood cells from bone marrow into the blood stream. The influx of white blood cells can alter the integrity of the blood vessels. The white blood cells are then absorbed into fat tissues where chemicals are released that cause inflammation. This study also involved mice exposed to about 111 ug/m3 PM2.5 for six hours a day - less than measured PM2.5 pollution that lasts for 6-8 hours in smoky parts of Armidale. “Our main hypothesis is that particulate matter stimulates inflammation in the lung, and products of that inflammation spill over into the body’s circulation, traveling to fat tissue to promote inflammation and causing vascular dysfunction,” said Sanjay Rajagopalan, professor of cardiovascular medicine at Ohio State and senior author of the study, which has been published in the journal, Circulation Research. Apr 2011 Polluted air increases obesity and Type 2 diabetes risk in young animals. Exposure to polluted air early in life led to an accumulation of abdominal fat and insulin resistance in mice even, if they ate a normal diet. 3-week old mice were exposed to 111 ug/m3 PM2.5 for six hours a day, five days a week for 10 weeks beginning when the animals were 3 weeks old. This time frame roughly matches the toddler years to late adolescence in humans. “This is one of the first, if not the first, study to show that these fine particulates directly cause inflammation and changes in fat cells, both of which increase the risk for Type 2 diabetes,” said Qinghua Sun, an associate professor of environmental health sciences at Ohio State University and lead author of the study, published in the December issue of the journal Arteriosclerosis, Thrombosis, and Vascular Biology. Apr 2011 A study, published in the journal Environmental Health Perspectives, found that mice exposed to particle pollution pollutants suffer significant brain damage, including signs associated with memory loss and Alzheimer's disease. In this case the mice were exposed to particles from traffic, but because woodsmoke and traffic particles both contain benzene and cancer causing polycyclic aromatic hydrocarbons (PAH) the effect of exposure to woodsmoke particles would probably be similar. Apr 2011 Otago: Last winter for wood heaters with emissions ratings more than 1.5 g/kg stoves - their use and opent fires will be banned from 1 Jan 2012. Apr 2011 Exposure to Biomass Smoke increase the risk of Chronic Obstuctive Pulmonary Disease (COPD). The authors of this review paper, published June 2010, examined the results of 15 published studies and concluded that people with biomass smoke exposure had 2.5 to 5 times greater risk of COPD. Mar 2011 Wood smoke harmful to health and DNA, study finds Elaina MacIntyre, a scientist at the University of British Columbia's School of Environmental Health, is lead author of a study comparing wood smoke pollution and doctor visits for middle ear infections of children ages 2 and under in the Vancouver area. Children with the highest exposures had a 32% higher risk than those with the lowest exposure. MacIntyre cautioned that families with young children in wood-burning areas should keep the windows closed and use a HEPA air filter. "Parents should be aware that wood smoke is an important risk factor in the development of childhood respiratory infections and that wood-burning increases the risk of these infections, not only for their own children, but also for children in their neighborhood," she said. Feb 2011 Air pollutants from fireplaces and wood-burning stoves raise health concerns. Scientists analyzed and compared particulate matter in air from the center of a village in Denmark where most residents used wood stoves to a neighboring rural area with few wood stoves, as well as to pure WSPM collected from a wood stove. Airborne particles in the village and pure WSPM tended to be of the most potentially hazardous size — small enough to be inhaled into the deepest parts of the lungs. WSPM contained higher levels of polycyclic aromatic hydrocarbons (PAHs), which include "probable" human carcinogens. When tested on cultures of human cells, WSPM also caused more damage to the genetic material, DNA; more inflammation; and had greater activity in turning on genes in ways linked to disease. Jan 2011 HEPA filters reduce cardiovascular health risks associated with woodsmoke pollution. A peer-reviewed research paper to be published in the American Thoracic Society's American Journal of Respiratory and Critical Care Medicine describes a study of healthy adults living in a small community where wood burning stoves are the main sources of pollution. The volunteers were provided with 2 HEPA filtration machine for the living room and bedroom, for 2 periods of 1 week. In one randomly chosen period, which was not disclosed to the participants, the internal filter was removed, to compare the effects of using the HEPA filter with an apparently identical situation where no particles were removed. Ryan Allen, PhD, assistant professor, Simon Fraser University, said: "Our results support the hypothesis that systemic inflammation and impaired endothelial function, both predictors of cardiovascular morbidity, can be favorably influenced by a reduction of particle concentration and add to a growing body of evidence linking short-term exposure to particulate matter with a systemic inflammatory response. Reducing air pollution appears to provide health benefits even if the pollution levels are already relatively low." "Ultimately, the best safeguard against these health risks is to minimize the amount of air pollution that is created." Jan 2011 A study published in the journal Chemical Research in Toxicology reports that smoking causes genetic damage within minutes. Scientists tracked polycyclic aromatic hydrocarbons (PAHs) on 12 smokers who volunteered for the study. One substance classified as a PAH, phenanthrene, was tracked by the scientists as it produced a substance described in the study to “trash DNA, causing mutations that can cause cancer.” The scientists said that the “effect is so fast that it’s equivalent to injecting the substance directly into the bloodstream. Although study investigated cigarette smokers, wood heater users should also reconsider - burning 1 kg of eucalypt hardwood in an AS4013 wood heater produces as much phenanthrene as in the smoke from 28,000 cigarettes. Dec 2010 PM2.5 exposure narrows blood vessels in the eye - an increase of 3 ug/m3 PM2.5 equivalent to 7 years of aging "Fine particle pollution or PM2.5 is particularly strongly associated with an increased risk of Cardiovascular disease (CVD) ... These findings indicate that living in areas with long-term air pollution or being exposed to short-term air pollution is associated with narrowing of the retinal arterioles in older individuals ... these findings support the hypothesis that long- and short-term air pollution increases CVD risk through effects on the microvasculature." world. ... wood smoke has been described as a strong carcinogen and a relevant risk factor for the development of NSCLC. Current data indicates that lung tumors associated with tobacco smoking and wood smoke show different clinical characteristics, which suggests that they might also have different genetic alterations, which are a consequence of tumor etiology." Current treatments for NSCLC are ineffective. The good news is that if they find out more about how woodsmoke and tobacco smoke causes mutations and NSCLC, they may also find possible treatments for it. "Maternal exposure to benzene is linked to neural tube defects in their offspring. The risk of giving birth to an infant with spina bifida – one type of neural tube defect – was more than doubled for women living in areas with the highest benzene levels compared to women living in areas with the lowest levels. Annual benzene levels for the "highest" exposure group ranged from approximately 3 to 7 µg/m3. These levels are a thousand times lower than the federal workplace limits for benzene." To put these results into perspective, The Launceston BTEX study reported average wintertime outdoor concentrations of 1.81 ppb of benzene (5.8 µg/m3) and 0.34 ppb of ethylbenzene (1.5 µg/m3). So wintertime exposures to benene in Launceston 2003 were towards the upper limit of the high group in this study. Table 5.12(b) of the BTEX report suggests that woodheaters emit about two thirds of wintertime benzene emissions (8,333 kg per month compared to 4,167 kg per month from motor vehicles). Reference: Lupo, PJ, E Symanski, DK Waller, MA Canfield and LE Mitchellet. 2010. Maternal exposure to ambient levels of benzene and neural tube defect among offspring, Texas, 1999-2004. Environmental Health Perspectives http://dx.doi.org/10.1289/ehp.1002212. 6 Oct 2010 Link between air pollution and breast cancer in Montreal. Journal article. Wood Smoke Causes Cancer—Another Nail in the Wood Burning Coffin. 3 Oct 2010. Recently the US EPA completed and released a major air quality health assessment initiative entitled the National-Scale Air Toxics Assessment. Pollution from burning wood in stoves and fireplaces and elsewhere was reported to be the top cancer risk in some areas. According to the EPA, the analysis indicates that burning wood creates a greater cancer risk than even benzene, a carcinogen emitted by cars and trucks in the tens of thousands of tons each year. The main toxins from incomplete combustion of burning wood—a class of chemicals known as polycyclic aromatic hydrocarbons (PAHs), which can be easily smelled—measure in the low hundreds of tons a year in some states that have characterized their wood smoke pollution more completely. “The PAHs are nasty things, “said Ted Palma, an EPA scientist who led the agency’s latest National-Scale Air Toxics Assessments released last year. Wood smoke was estimated by the EPA to have the greatest cancer-causing potential of all pollutants in Oregon’s air. Mexican women who do not smoke but are exposed to smoking, known as environmental smoke exposure, are at three times higher risk for breast cancer than non-smoking women not exposed to passive smoking, according to findings presented at the Third AACR Conference on The Science of Cancer Health Disparities, being held Sept. 30-Oct.3, 2010. Although this focussed on environmental tobacco smoke, as noted above, the pollutants in wood smoke have a much greater biological impact in the human body compared to cigarette smoke or even automobile exhaust on a per unit weight basis. 24 Sept 2010 Are dust, smoke and exhaust really killing thousands of people each year? Looks at the recent report by the US EPA which was the first to establish a causal relationship between early death and fine particulate matter. 15 Sept 2010. North Americans and Europeans using wood as the main heating or cooking have 21% higher lung cancer risk , Environmenal Health Perspectives. Other research showing that exposure to wood smoke increases the risk of mouth and throat cancers. Research published in 2002 in the International Journal of cancer showed that women with the cervical warts virus who are are exposed to woodsmoke when cooking were up to 10 times more likely to develop cervical cancer. After reading a paper from Association for Environmentally Conscious Builders explaining why natural gas heating coupled with energy efficiency measures are better for the climate than using a wood stove, Rob Hopkins, founder of the Transition Towns movement, opted not to install a wood heater in his home. The National Environment Protection Council (NEPC) has released a discussion paper on Air Quality Standards for the Ambient Air Quality NEPM. The paper notes the considerable problems caused by PM2.5, and summarises air quality standards in other countries. Given the serious health effects, with no known safe level of PM2.5 pollution, a new approach is needed to reduce our exposure to health-hazardous PM2.5. As well as formalising the recommended standards of 8 ug/m3 annual average PM2.5 and 25 ug/m3 (daily average), a new approach is needed. If you are concerned about the health costs of PM2.5 pollution, please submit comments urging the NEPC to introduce reporting strategies that keep the public informed about the health costs of PM2.5 and aim for PM2.5 levels that are "as low as practical". Submissions are due by Friday 27 August 2010. See our draft submission for more ideas and suggestions. REVIEW OF WOOD SMOKE EDUCATION PROGRAMS in the Australian Capital Territory (ACT) - submission by the Tuggeranong Community Council (TCC). As well as supporting a review, the TCC believes the ACT Government should also consider the experiences of other jurisdictions where anti wood smoke education programs have failed. The TCC believes that for future education programs to succeed, particularly in the Tuggeranong Valley, they should focus on the public health impact of wood smoke pollution. The first scientific study in US on the effects of wood smoke in smokers shows that wood smoke exposure results in a 96% increase in the risk of chronic obstructive pulmonary disease (COPD) and reduced lung function in cigarette smokers. Robert W. Rubin, Ph.D., CEO of Lovelace Respiratory Research Institute, said, "Many people use wood smoke as a major heating source and also smoke cigarettes, and this research proves that it can be a very unhealthy combination." Rubin continued, "With the legitimate concern to find alternative energy and heating methods in the world, we need more research of this kind to make certain that we do not add to the many factors in the air we breathe that will contribute to the destruction of lung function." Are school heaters poisoning our kids? Armidale express, 26 May 2010, discusses the problem of unflued gas heaters in schools. They are banned in Victoria, South Australia, WA and the ACT. The NSW Government commissioned a report in 2009 to determine if "low-Nox" unflued heaters cause problems, but has not yet released the report. Includes quotes from Amidale Dumaresq Councillor Dr Dorothy Robinson, New England MP Dr Richard Torbay and NSW Greens MP Dr John Kaye. ScienceDaily (May 19, 2010) — Breathing polluted air increases stress on the heart's regulation capacity, up to six hours after inhalation of combustion-related small particles called PM2.5, according to Penn State College of Medicine researchers. ... "Air pollution is associated with cardiopulmonary mortality and morbidity, and it is generally accepted that impaired heart electrophysiology is one of the underlying mechanisms"
A Burning Issue: The experts speak about wood smoke..
• The negative effects of smoke on the cardiovascular system may occur at relatively low levels but they increase the risk of heart or stroke death. • People smoking three or less cigarettes a day had about a 65 percent higher risk of death from cardiovascular disease. • Those exposed to air pollution and secondhand smoke had a 20 percent to 30 percent higher risk of death from cardiovascular disease compared to those without exposure. "Clearing or cutting forests for energy, either to burn trees directly in power plants or to replace forests with bioenergy crops, has the net effect of releasing otherwise sequestered carbon into the atmosphere, just like the extraction and burning of fossil fuels." In December 2009, after 33 breaches of the air quality standard, the US EPA set a three-year deadline for Chico, a small town in Butte County, to clean up its woodsmoke pollution. A local reported asked physicians, research scientists and other experts in Chico and nationwide how tiny particles and other ingredients of wood smoke may affect people's health. "I'm convinced that it causes potentially serious health effects in some people, particularly asthmatics ... If you're immediately downwind from someone who's burning, you can really get a significant exposure." Michael Lipsett, MD, chief, Environmental Health Investigations Branch, California Department of Public Health. Dr Lipsett developed public health and medical guidelines for state's outdoor air quality standards. "I think we need to educate the public ... I don't think they realize how toxic wood smoke is. I don't think we've done a very good job about that." L. Gretchen Wooding, MD. NZ is reviewing its National Environmental Standard (NES) on air quality. Papers, discussion documents and an online submission form are available at http://www.mfe.govt.nz/news/2010-06-09-air-quality-review.html NB the deadline for submissions is Friday, 9 July. "The Health and Air Pollution in New Zealand (HAPINZ) report estimated that 1,100 Kiwis die prematurely each year because of air pollution, and many more children and adults suffer from debilitating asthma and respiratory illness. Instead, the air quality standards standards should be upgraded by the introduction of a much-needed PM2.5 standard, allowing NZ to aim for the greatest reduction in the pollutant that most affects our health for the least possible cost. This cannot be achieved if the pollutant most closely linked to adverse health outcomes is not even considered. See our draft submission for more ideas and information.